We will provide emergency dental care for all individuals during regular business hours. After hours dental care is provided 24-hour a day, 7-day a week, including holidays; exclusively for patients of record. Unfortunately we are unable to provide after hours emergency care from all of our office locations. Therefore, we apologize in advance for any inconvenience, but may request that you travel to the Roswell location should an office visit be needed in such instances. Should your child suffer a dental emergency during typical business hours, please immediately contact the office closest to your home and we will promptly triage the injury. Once an attending pediatric dentist is able to review your child’s emergency, we will either provide over-the-phone recommendations or will provide you with an appointment depending upon your child’s specific symptoms. We truly appreciate your understanding and flexibility when attempting to schedule your child’s dental emergency. Occasionally treating a dental emergency will cause us to run slightly late with our regularly scheduled patients. When this occurs, we apologize to all our patients, request your understanding, and will do our best to keep you informed. Should our office not be open, an on-call pediatric dentist can be reached 24-hours a day for patients of records only at 1-866-978-2728. We would also appreciate if parents could have their family’s pharmacy telephone number available, as the on-call pediatric dentist regularly uses this information to prescribe medications to help with certain symptoms. Keep the tooth moist at all times. Hold the tooth by the crown, and if the tooth is dirty, rinse it in water. Do not scrub the tooth or remove any attached tissue fragments. The tooth must not be left outside the mouth to dry. If possible, gently insert and hold the tooth in its socket. If it cannot be replaced in the socket, put it in one of the following: (1.) emergency tooth preservation kit HANKS BALANCED SALT SOLUTION, (2.) milk, (3.) mouth (next to the cheek), (4.) if none of these are available, use water with a pinch of salt. Bring the patient (and don’t forget the tooth!) to the pediatric dental office as soon as possible. If this accident occurred after normal business hours, immediately activate the emergency on-call number to obtain specific instructions. Ideally, this tooth needs to be reimplanted as soon as possible. Because primary teeth have a poor posts-implantation prognosis, these teeth are not reimplanted into the mouth. Long-term studies have shown that reimplantation of these teeth routinely cause infection and possible damage to the developing permanent tooth. We do, however, recommend that you contact your pediatric dental office to notify them of this injury. Normally a routine visit will be scheduled to x-ray the avulsion site to ensure the entire tooth actually came out. Rinse the mouth with warm water to clean the area. Put cold compresses on the face to keep any swelling down. Take your child to see a dentist right away. If possible, take the broken tooth fragment with you. Though this fragment is normally not used to repair the tooth, it can provide some additional information as to the type of injury that was sustained to the tooth. Immediately apply cold compresses to help control any swelling. Contact or take your child to your pediatric dentist or a hospital emergency department immediately. Object Caught Between the Teeth. Gently try to remove the object with dental floss. If you’re not successful, contact your dentist more additional advice. Do not try to remove the object with a sharp or pointed instrument as this can cause additional damage to the teeth and surrounding tissues. Rinse the mouth with warm salt water to clean out any loose debris. Gently use dental floss to remove any food caught between the teeth. Do not put aspirin on the aching tooth or gum tissues. Analgesics such as Tylenol or Motrin can be used to alleviate any pain. 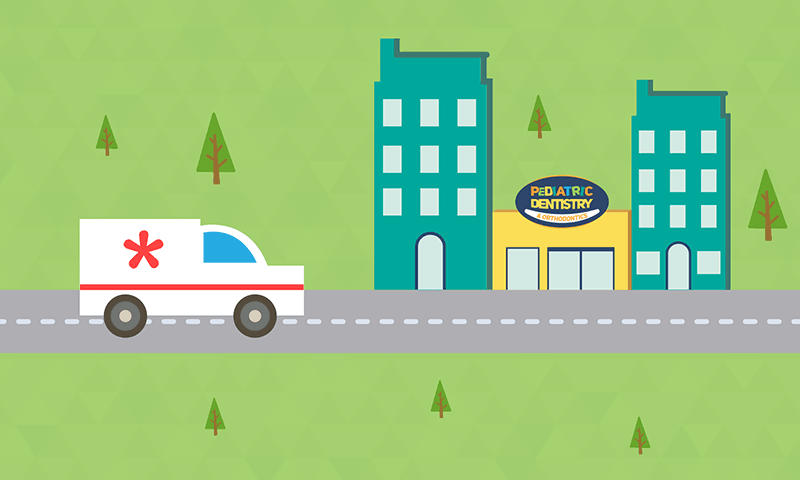 Take your child to visit the pediatric dental office during normal business hours. If you require advice call the emergency number, It is important that you have a pharmacy telephone number available, as the pediatric dentist will routinely call in antibiotic. Clean the area gently with a moist cloth and put a cold compress on the area to minimize the swelling. If bleeding is excessive or does not stop after a few minutes of pressure, take your child to a hospital emergency room or your pediatric dental office.